I’ve been wanting a larger tote to carry around my larger knitting or other projects. I’m testing a few different ones to see which is going to be the perfect one, though the reality is that I always have multiple projects on the go so this will let me have one bag for each. 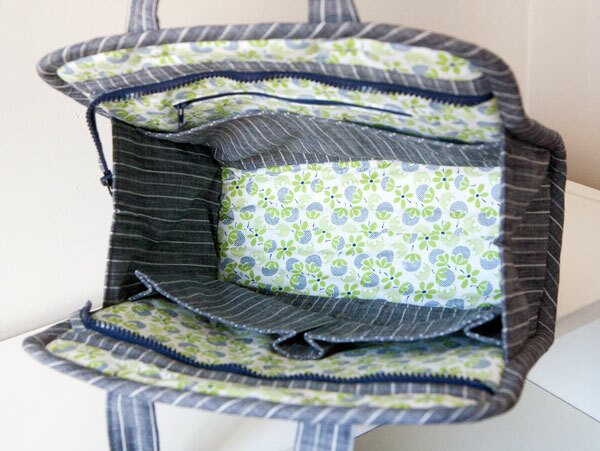 This way I don’t have to swap projects out depending on my mood–I can just grab the right bag! Ha! 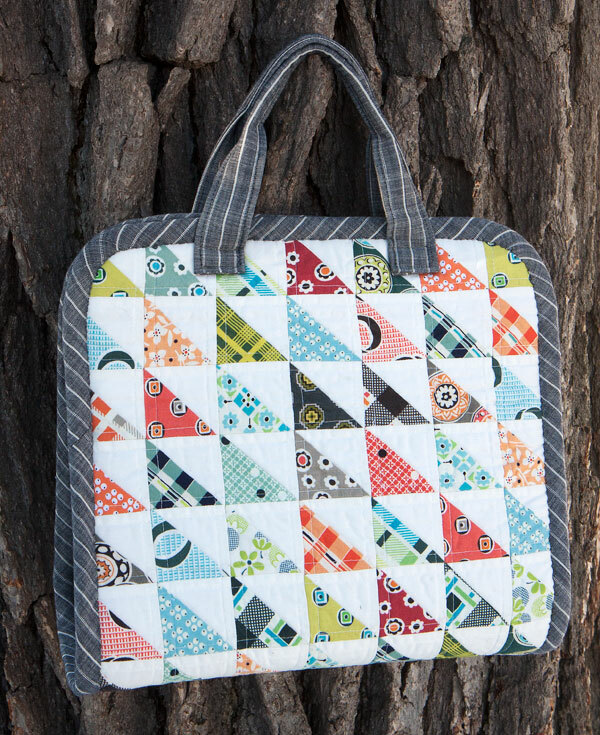 This one is the Maker’s Tote by Noodlehead in the smaller size. I have the larger size cut out, too, so that is not too far behind! So I thought I’d make a scrappy outer panel for this one. As it happens, in my scrap bin I have zip-top bags full of triangle trimmings from quilts I’ve made. I loved the Denyse Schmidt triangles from my Ring Toss quilt and so I decided to finally use them! It took a bit of math but I used most of them up. Yay! I quilted the panel with some fusible fleece before fusing it to some Pellon fusible foam. (To be totally real, I first quilted it to the foam and it looked absolutely hideous, so I ripped that out and re-quilted it to just the fleece). I didn’t want to mess with putting a zipper or a pocket on the outside of the bag and disturbing the patchwork, so I omitted the pocket and moved the zipper to inside the bag. The long main zipper I fought with a LOT and installed it about five different times, trying to get it to lie flat instead of wavy like in the photo. I eventually figured out that because I had used glue to baste the zipper in place and then ironed it, I actually shrunk the zipper tape so there was no way to get it to lie flat after that. Must be something about this kind of zipper because I always glue baste my regular zippers without issues. Lesson learned! I really like how this bag came out. The binding (and wavy zipper issue) were not easy, but otherwise it wasn’t too difficult. The only thing I’m having second thoughts about is having so much white on the outside of the bag–now I’m worried it will get dingy pretty quickly so I’ll have to take good care of this one and not put it down carelessly! Dimensions: Exactly as written in the Noodlehead Maker’s tote pattern, small size. 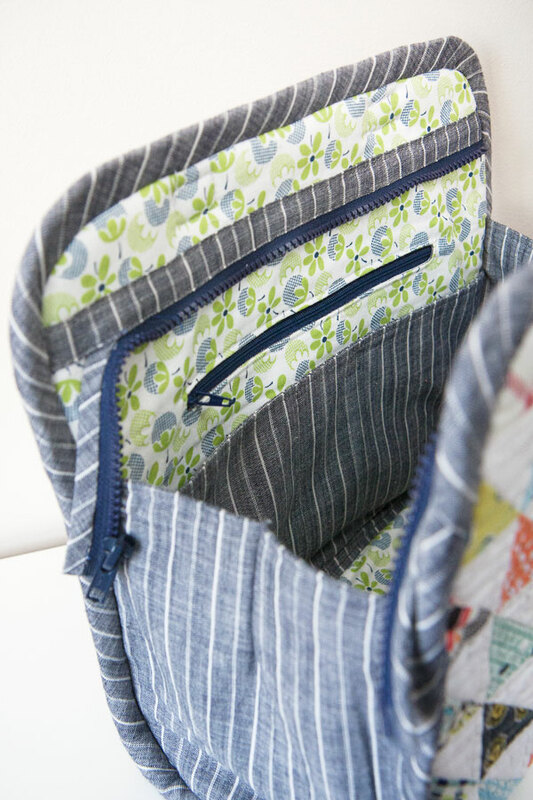 See you back here next time with another zipper project! Your bag is beautiful! I’m also a knitter, and this is one of my favorite bag patterns. What a great looking bag. 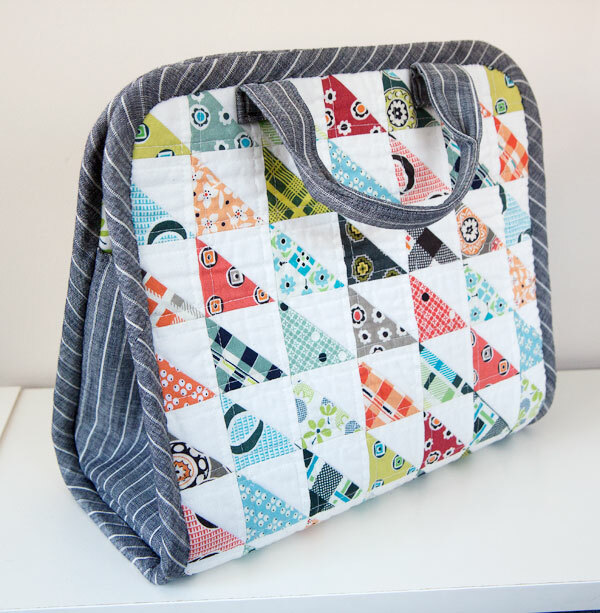 Super cute with the half square triangles. Love the bag. I haven’t ever made a bag, but have it on my list for this year. Could you maybe Scotch Guard the outside of the bag so it would resist dirt? 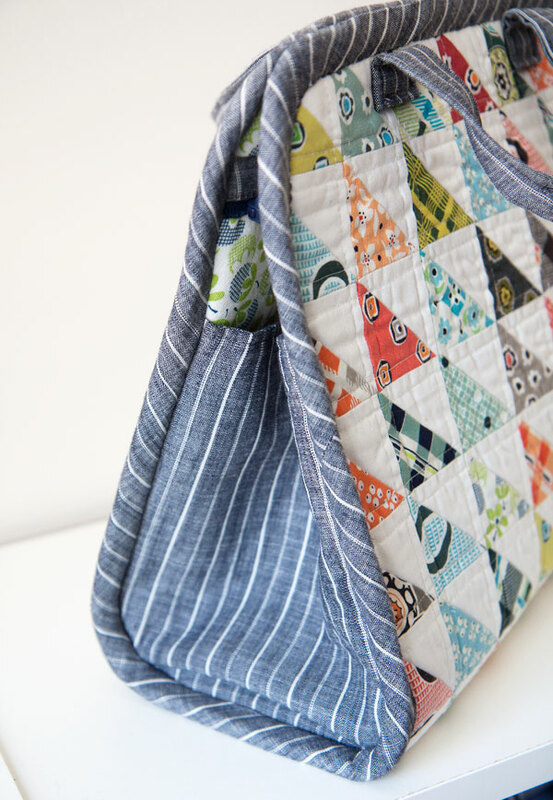 Cute, cute bag and a GREAT idea for scraps!! !